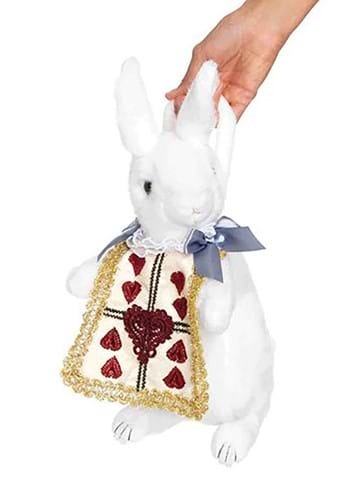 Match our white rabbit wonderland purse with an Alice costume or queen of hearts costume for a memorable Halloween costume look! The novelty handbag is shaped like a bunny and includes a friendly face with floppy ears. The bunny is wearing a cream tunic lined in gold ribbon with black trim and dark red embroidered hearts (please note, the tunic's color and design varies slightly from the picture). 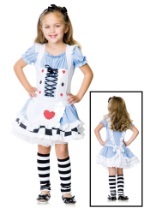 The tunic is topped off with a white ruffled collar and accented with blue bows on the side. A small hand strap is located on the back of the bunny along with a zipper to keep all your personal items secured inside. The handbag measures 14" tall and is 6" wide. 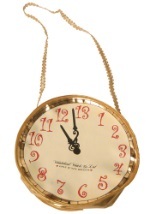 Store personal items in this cute bunny handbag for a fantastic Alice in Wonderland costume accessory!